Pocket gophers, often called gophers, are burrowing rodents that are well equipped for a digging, tunneling lifestyle with their powerfully built forequarters; large-clawed front paws; fine, short fur that doesn’t cake in wet soils; small eyes and ears; and highly sensitive facial whiskers that assist with moving about in the dark. These little guys can invade your yard and feed on your garden, ornamental plants, shrubs, bushes and even trees. 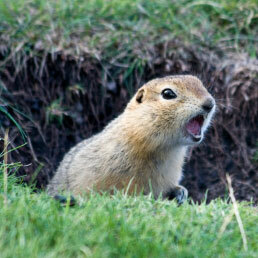 One single gopher can cause significant damage to your property. They can even gnaw on and damage your sprinkler system. The sooner you notice a gopher problem, the better. Keep and eye out for the signs and if you notice any, call Achieve Pest Management to remove them immiediately.